(MENAFN - The Conversation) Ideas matter in politics: they shape how we see the world. Of equal importance are the tropes – those recurrent themes which give shape to ideas and can pull a political movement towards the open fields of popular relevance or push them down the blind alley of sectarianism. This trope was obediently repeated by many of Jeremy Corbyn's other leading ideological outriders, including Owen Jones , and afterwards echoed by innumerable others across social media. For them, the lesson of Bolsonaro's victory was clear. Since the 2008 banking crash neoliberal capitalism has been in crisis – and, when push comes to shove, the politicians that Corbynites describe as 'centrists' will back fascism rather than socialism in attempting to resolve it. Whatever its historic origins and irrespective of being provoked by events in Brazil, 'socialism or barbarism' was disseminated primarily to make a contemporary and parochial point. Only a Corbyn-led Labour government committed to the creation of a socialist economy will save Britain from a fascist answer to the crisis of neoliberalism. As the hard left anticipates the prospect of power, the more it fears failure to achieve it. After the 2017 election, Labour felt confident of assuming office. That now looks much trickier . The Corbynite imaginary – it's values and images – therefore now alternates between dark forbidding shadows and a blinding sunlight. This politics of dichotomy is aimed not at the far right but the centre left – Labour's social democrats. These social democrats, the argument goes, are not only responsible for creating the present crisis but would hand the initiative to the far right should they ever regain influence in the party – or set up their own party. In the battle of 'socialism and barbarism', social democrats will always lean towards the latter because they want to make capitalism work. The hard left, meanwhile, sees capitalism as the source of all ills and wants it destroyed. Once it didn't matter too much what the hard left thought, as they only existed on Labour's margins. But now they run the show and 'socialism or barbarism' is a useful rhetorical device to undermine their centre-left rivals in the party. For this social democrats only have themselves to blame. That Corbyn found himself leader in 2015 is largely due to their own failure of ideas . Committed to increasing equality through a largely capitalist economy, they have been befuddled by the complex problems posed by austerity and failed to develop a response that satisfied party members or the electorate. In contrast, Corbyn at least offers members certainty. Whether social democrats will find the ideas to fuel a future challenge to Corbynism remains a moot point. But if many Labour members find inspiration in the drama of dichotomy, those millions outside the Corbynite imaginary will wonder how far it matches their understanding of reality. The threat of fascism certainly seems remote. And while institutional racism exists in the UK, for instance within the ruling Conservative party, there is evidence that it is often stopped in its tracks. The Windrush revelations , for instance, became a huge public scandal, and forced the home secretary to resign. There is of course turmoil in Britain – the public realm is suffering due to austerity while the uncertainties of Brexit compound its inegalitarian impact. And many voters now support a readjustment in the relationship between government and the free market. Britain is however not necessarily enduring the kind of systemic crisis of capitalism of which Corbynites such as Paul Mason enthusiastically write . But the biggest problem for those wishing to dichotomise politics is that few in the public think like they do. Majorities can in fact be found for policies that could form the basis for socialism and barbarism, such as both nationalising the public utilities and banning all immigration . Inconveniently enough, while Momentum was proclaiming that the choice before Britons was 'socialism or barbarism', Labour's parliamentary leadership made a nonsense of it by indulging in a classic piece of 'centrism'. In his budget chancellor Philip Hammond proposed tax cuts, the value of almost half of which would go to the top 10% of households. 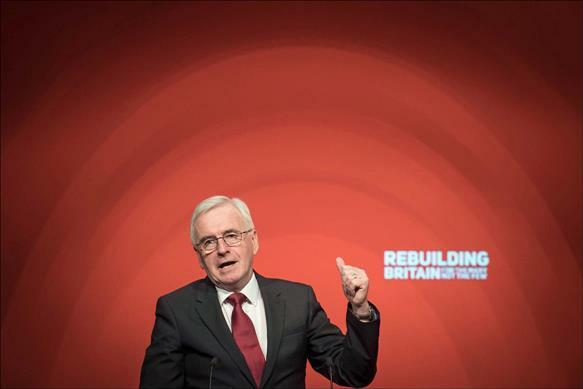 Despite this, shadow chancellor John McDonnell, not wishing to alienate middle-ground voters who would gain from the cut, insisted Labour MPs support the measure. 'Socialism or barbarism' reflects how Corbynites think of politics. A morbid capitalism has to be transcended by socialism and a Corbyn-led government is the only hope of achieving that. But as McDonnell's support for tax cuts and Corbyn's own ambiguities on Brexit and immigration indicate, when the object is building an election-winning coalition, sincerely expressed rhetorical tropes often find themselves bumping into the imperative to reconcile different interests.